Let us show you the many benefits of IMAT’s consolidated patient record and reporting interface. Do your existing systems give you the same functionality? If not, why wait? Request an IMAT demo now! IMAT presents an integrated patient view from within a single patient record interface because our system collects, normalizes and validates patient data – in near real time – from multiple sources including community eHealth exchanges, PACS, labs, EHRs, and other record exchange networks. IMAT’s Enterprise Patient Index does record-to-patient matching using deterministic and probabilistic analysis, and can work with all record types, generated by multiple, incompatible sources within your healthcare community. All this at over 200 records per second. IMAT’s Unified Data Foundation preserves the original source record contents and presents a standardized version of the record, managing over 35 Tb of data on a single server. IMAT applies multiple validation and normalization rules to incoming data, ensuring industry standards, cross mapping of codes and accurate reporting for Quality Measures and Population Health reporting. IMAT’s Unified Data Foundation enables you to retain and access all your historical patient data, even when dealing with multiple, incompatible EHR platforms due to acquisition or a new software initiative. IMAT’s Reporting Tool combines structured and unstructured data, ensuring that your Population Health Management and Quality Measure reports have the most comprehensive results. Custom Reports created on the IMAT platform can be easily updated, as can scorecards and healthcare dashboards, to keep current with updated industry mandates. Too frequently, physicians don’t have all the patient data they need to best diagnose and coordinate care. 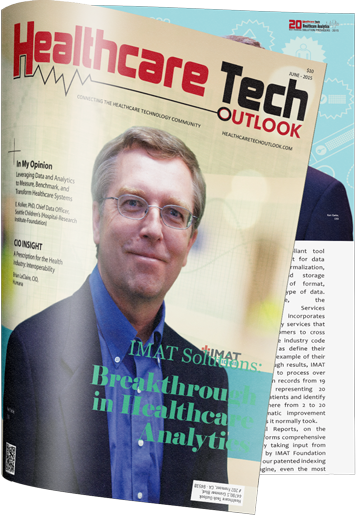 IMAT consolidates data from across the healthcare community to give providers a 360° view of every patient. With better patient data, organizations can improve patient outcomes and reduce the cost of care. To see IMAT in action, please enter your contact information here. We’ll contact you to set up a live demo.